It rained. Part of the building had fallen off. The bar was heaving with Carphone Warehouse partygoers. But The Rialto launch last night was a small haven of poetry peace amidst the chaos. Although I got there indecently early (I had the silly idea that it was starting at 6.30) Fiona Moore made me very welcome and I was soon joined by Sarah Rudston, Nancy Campbell and Davina (D A) Prince, all contributors to this issue. There was plenty of chat about publishing, Stanzas, workshopping and the like. Michael Mackmin arrived with a huge bag of magazines and pamphlets. We had readings from five poets including Fleur Adcock and Stephen Watts, and although I had to leave soon after the readings and speeches to get a 9pm train, the room was still full and animated. I found it a really nice and non-intimidating event. As well as a launch (the first time The Rialto has had one in London) it was also a celebration of the Assistant Editor programme as Abigail Parry and Fiona Moore ended their ‘apprenticeship’ which they had clearly enjoyed. I was also thrilled to finally introduce myself to Michael Mackmin after my last aborted attempt! 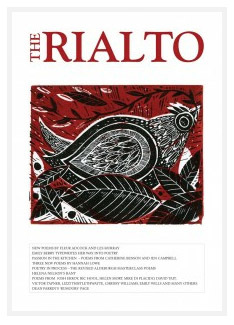 I’ve talked before with poet friends about how The Rialto just seems to have a particular appeal in a way that other magazines, however brilliant, don’t quite have. Is it the production values – the size, spaciousness, paper, typefaces, beautiful covers? Is it the personable and down to earth editorials? The submissions guidelines that manage to be firm without being school-masterish or snitty? The twenty-pound note that falls from the envelope when you’ve had a poem accepted for publication? The poetry itself? What we usually agree on is that it’s Michael Mackmin’s personality and particular style that seem to be the key. The Assistant Editor programme has been interesting. I was slightly disappointed with issue 79, I can’t say for sure why but it felt like the range of poetry featured had narrowed. What I’ve read so far of issue 80 I’ve really enjoyed. Fresh eyes and fresh ideas are surely a good thing for any long-running project, but as long as Michael is still around it’s unlikely The Rialto will undergo any major overhaul. And would anyone want that anyway? Latest acquisitions: Earlier in the day I had been at the London Review Bookshop round the corner from the British Museum. The downstairs room is a lovely space with an acre of poetry – and whose book should I spot but Jenny Lewis’s Taking Mesopotamia. Jenny was on the Ty Newydd course last October and this is her new collection from Carcanet. I picked up a copy of Paul Muldoon’s Horse Latitudes. Paul read at the Charleston Festival a couple of weeks ago and I regret not seeing him. He’s a poet I’ve not read so this was my ‘canon’ purchase. Then I spotted Josh Ekroy’s new collection, Ways to Build a Roadblock. His is a name I know well from magazines, so I was intrigued enough to buy a copy, much to the pleasure of the chap on the till. Later on at The Rialto event I was impressed by Michael Mackmin’s talking up of ‘A bad influence girl’, Janet Rogerson’s pamphlet, so that was my third purchase. So lots more lovely reading. Submissions: ‘Send us some poems!’ said Fiona Moore as I left. When I told her I already had some out to The Rialto, sent in February, she looked puzzled. ‘You should have heard by now.’ Oh no – the words I dread – alarm bells ring, has it happened again, did my precious submission not arrive? Am I the only one this happens to on a regular basis? Lost poems, poems accepted for a magazine but then left out, poems accepted then same poems rejected by the same magazine… my submissions seem to be dogged by problems. Almost wishing for a short, sharp rejection instead of facing another nails-down-the-blackboard ‘black hole’ scenario. We’ll see. Becky – thank you for your encouraging words! Although I think ‘sought out’ is a little hopeful …I think Fiona’s comment was just meant casually… but hey, these things take time! And as for the bookshop – oh what a SHAME – I would have been delighted to look for your book AND talk it up to the manager, just the sort of job I like when it’s on behalf of someone else, but lousy at it when it’s my own work. I had a handful of my pamphlets with me last night, but did I give any to people, or leave any ‘casually’ around the place?? No! Sounds like a good evening, Robin. It’s always difficult to know if a mag is slow to reply on submissions, whether it’s because they’re having difficulty because the poem is so close to what they want or whether they’re just chaotic. In the present case I’m sure it’s the former – I had a rejection package back from The Rialto after two months recently, which is record time, and although there was the usual kind manuscript note from Michael M I thought the speed was perhaps a bit of an indicator! Delighted to see you’ve got Jenny Lewis’s book. 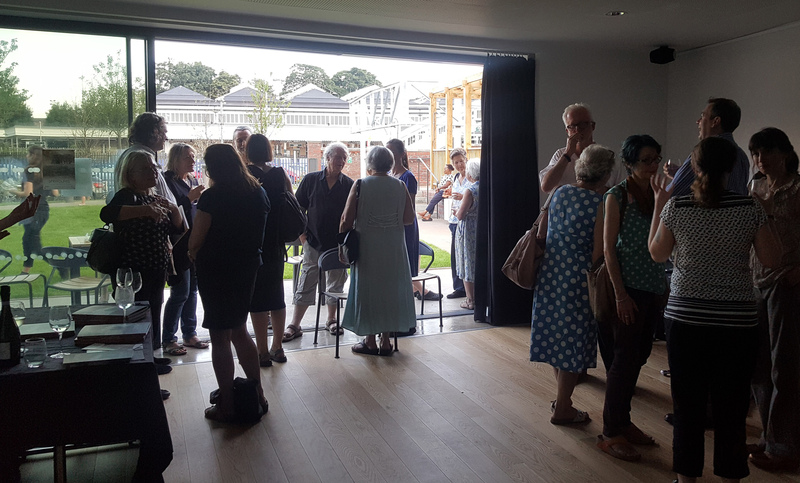 I plugged it recently when Paul McGrane asked about summer reading – all because I’d read about her in your account of the Ty Newydd experience. I think it’s a remarkable achievement, working on all sorts of different levels. Thank you Antony, yes there’s something about the quick rejection that stings slightly – I guess it’s just psychological though, if you hear back after four months you can console yourself with the idea of the poor editor agonising for four months over whether to include your poem or not… when in reality it’s been in a pile and he only picked it up and read it yesterday – tee hee. My quickest rejection ever was from Acumen – same day I think!! Re Jenny Lewis – she’s a fine poet I think, and a very modest person to boot, so I’m delighted to have given her a bit more exposure. Thanks Robin for this lovely account! Glad you had a good evening, so did we. The Crown kicked (v nicely) the last of us out of the room at 10.30. As for your poems: we are reading everything within three months at the moment… so we are going to look for yours. HI Fiona – thanks for your comment, glad to hear the buzz went on for a while, it’s the kind of thing that makes me wish I lived in London and didn’t have to always leave an event early like Cinderella. Thank you for having a rummage for my poems, if you do find them I hope they don’t prove too much of an anti climax. Actually a few people have responded to this post to tell me that they’ve experienced the ‘disappearing poems’ thing quite regularly (though not with the Rialto I’m sure!) so I guess I need to get over myself and realise it’s a common phenomenon and should be pleased when a submission does actually arrive and get read!